DOVER, Del. 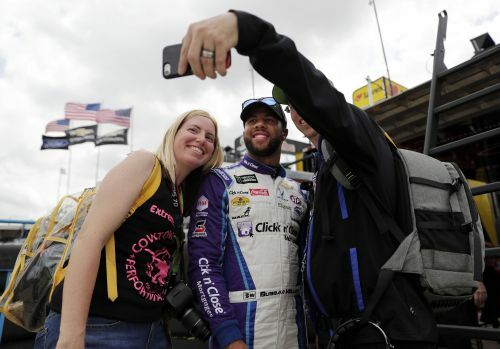 (AP) — Darrell Wallace Jr. was a budding photographer his first few years at the track, snapping away with his Canon 60D to show an insider's view of NASCAR. The hobby is on hold. Wallace fills his social media feeds with photos shot on his mobile phone. The fancy camera still has the lens cap on. "I just don't have time for it now," Wallace said. "This Cup schedule, it takes all your time away." Wallace's career has come into focus this season in his first full Cup season and he finds himself on the other side of the camera as one of the sport's media darlings. The 24-year-old Wallace has given Richard Petty Motorsports a needed dose of enthusiasm and plenty of optimism with the kind of results that show perhaps better days are ahead for the famed No. 43 car. "He can be as good as anybody," Richard Petty said. High praise coming from a Hall of Fame driver who was at NASCAR's first race. Better known as "Bubba," Wallace would at least like to be better than 22nd in the standings when the season comes to a close. But making it to Cup and having the security of a ride is a victory itself following a career full of fits and starts through the developmental ranks. Wallace made his second-tier Xfinity debut in 2012 and made his first four Cup starts last year for RPM as a fill-in for an injured Aric Almirola. "You hear to so much about him, you'd think he's been here forever," Petty said. Wallace has maximized his exposure through his nearly 173,000 Twitter followers, a docu-series on the Facebook Watch show page that ran around the Daytona 500 and the natural attention that comes as one of the few black drivers in NASCAR history. He is already the best of the bunch and hasn't been distracted by the added scrutiny that comes along with his slice of history. "I've enjoyed it, from on-track stuff to off-track stuff, getting a lot more attention and kind of growing your brand," Wallace said. The Alabama native knows winning can change his career. He flirted with contention in a few races and led laps at Bristol (6) and last week at Talladega (5) but failed to build those runs at the top into a top-10 result. Still, Wallace was second in the Daytona 500 and put the sport on notice that he was no ordinary rookie. "I think that set the bar high for outsiders looking in," Wallace said. "For us, we were just like, great race, that means nothing, let's go to work." Wallace is hardly alone when it comes to NASCAR's prominently pushed collection of blossoming young drivers — the "Young Guns" as they've been tagged — who can't win. There was so much hype at Daytona around Wallace and other early 20-somethings (such as Chase Elliott and Ryan Blaney) that veterans sort of got lost in the shuffle. That was about the last time they lost anything — former Cup champs Kyle Busch and Kevin Harvick each have three wins. Racing against the big boys has meant some adjustments. The biggest surprise? "Just how aggressive this sport is," Wallace said. "It's a challenge. Once you get to this level, you have to be the aggressive one." RPM and Wallace are on a bit of a learning curve, not just with each other, but with an organization that underwent an overhaul that included a switch to Chevrolet and a technical alliance with Richard Childress Racing. "He's making rookie mistakes and we're making mistakes because we don't know him that good, either," Petty said. "If we get all the mistakes behind us, we're going to be in good shape. He's learning. He's racing good. But then he misses a gear or comes down pit road too fast or misses the pit." Wallace will start 26th in Sunday's race at Dover, a rare misstep at a track where he has had great results in other series. Wallace won two poles and finished second in six races at Dover in the Xfinity Series. He was still a hit at Dover, signing for a steady stream of autograph seekers and posing for selfies. Winning races — as he has six times in Trucks — and popularity contests hasn't done much to land him full-time sponsorship. Wallace lost his Xfinity ride last season when cash dried up and RPM has patched together deals for this season. World Wide Technology just signed on for six races in a deal that starts next week at Kansas Speedway. He still has 17 races this season without a primary sponsor. "Companies just don't have the money to spend. It's a tough battle, I get that," he said. And one other drivers are facing, too, as ratings and attendance continue to sag and companies pull back. "People are looking at it different than what they used to," Petty said. "A lot of the sponsors are losing interest, also. They're interested in it but if they're spending money, they've got to get it in front of enough people to make it pay off for them." RPM believes it has a winning combination with Wallace — now they need a checkered flag or two to prove it. "When he gets his stuff together and we get our stuff together," Petty said, "we're going to be pretty good."